DOMESTIC TRAVEL: All travelers, age 16 and older, need a valid driver's license. Doublecheck to make sure your license has not expired. • Bring activities and books, games, special toys and movies for children. • Take care of International Driver’s License requirements if you wish to rent a vehicle. and pack appropriately. Sunscreen and aloe is less costly in the US. • Research voltage set-ups. If needed, bring an electrical adapter for cords. • Phoning home: Purchase an International Calling Card. It will save money! Mexico and the Caribbean often accept (and sometimes prefer) US currency. during your trip. Couples should carry duplicate cards. • Exchange Rates: see the following website for currency conversion assistance. Visit https://travel.state.gov/content/passports/en/passports/renew.html for your form and more information. Carefully review all visa requirements for destination countries. Give a family member or friend copies of travel documents and passports before you leave. A passport must be valid at least 6 months from the departure date. For newly-married individuals: you must travel by the name on your ID and passport, so purchase tickets accordingly. 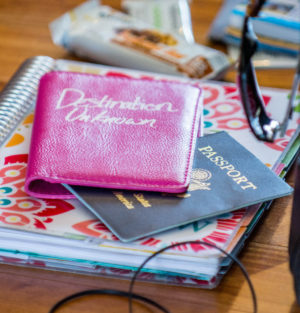 You may be the new Mrs. Johnson, but are still Ms. Smith to customs and airline officials! Legal guardian(s) and parent(s) not traveling with minor child(ren) must officially approve international travel. This consent must be in letter form, signed, and properly notarized. If their legal guardian or absent parent is deceased, adult(s) traveling with children must bring death documentation.